“My passion is to heal the sick to the best of my ability with the help of the people around me in the clinic, in the church, and in my community. I want to be a role model to my family, and to be treated with the respect and integrity as I do the same with everyone that I meet. Dr. Blandina Sison has been in practice in the United States for more than 20 years as a family practitioner.Prior to that she was an anesthesiologist in the Philippines. She is dedicated to providing kind, caring, nurturing and efficient care to her patients. Dr. Sison likes to empower her patients to improve their health and well being. 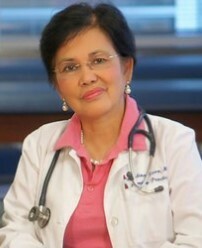 Dr. Sison received her medical degree from the Philippines and practiced as an Anesthesiologist for 10 years. She came to the U.S. in 1985 and became a Family Practitioner. Dr. Sison completed her internship and residency in family medicine at the University of Texas Conroe Family Practice Center. Dr. Blandina Sison is a member of the Texas Medical Association. “I feel very at ease when I visit Dr. Sison. she treats u like u are part of her family.